With torrential rain, gale force winds and flood warnings in place for much of the country yesterday, The Bike Insurer-sponsored World’s Largest All Female Biker Meet at Lynn’s Raven Cafe didn’t quite get off to the start anyone wanted. But, despite the monsoon, some 443 hardy female motorcyclists from as far and wide as Scotland and Cornwall showed up to the Whitchurch, Wrexham bike meet to support the world record attempt. Sadly, the weather meant organisers didn’t quite hit the 1133+ riders they were hoping for to break the current record of 1132 female motorcyclists, but organisers are hopeful of another attempt in 2019. However, the event did raise £2,458 for charity to be split between The Shropshire and Staffordshire Blood Bikers and BBRF (British Bikers Relief Fund). 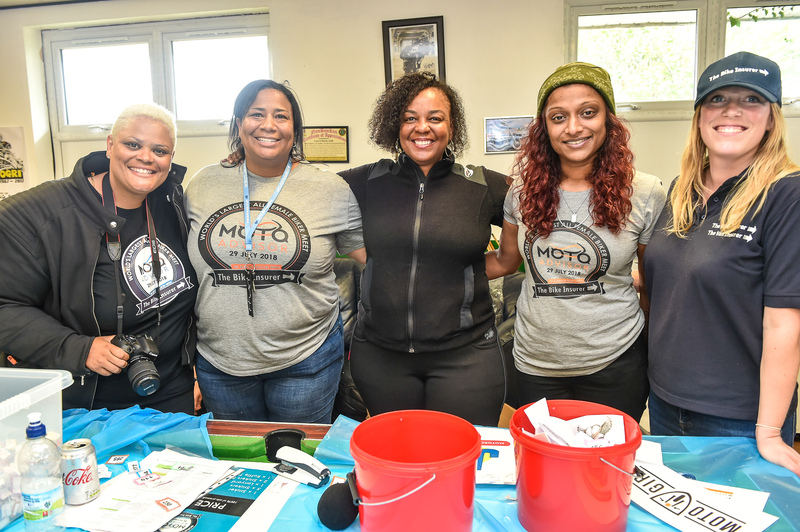 The World’s Largest All Female Biker Meet is the brainchild of bikers Nimi Patel and Sherrie Woolf who were keen to raise awareness of increasing numbers of women riding motorcycles, and to improve bike and product ranges aimed at women. An increasing number of woman riders are taking motorcycle tests in the UK, up by 33% last year, compared to the number who took tests in 2013/14. Manufacturers including Triumph, Honda, BMW and Ducati are also increasingly offering lower seat height options aimed at woman on some of their key models. The largest group of female licence holders by age are women aged 51-years-old. Latest MCIA statistics show 11,810 of them have a full licence for either an A1, A2 or A class motorcycles. The MCIA also revealed that women aged between 41 and 53 represent a higher ratio of female to males taking a theory test. Of all motorcycle theory tests taken between 2016/17 around 9% were women, but for those aged 41 – 53, this rises into the teens, with 16% of all theory tests taken by 53-year-old women. Other attempts at claiming the prestigious title of The World’s Largest Female Biker Meet have taken place in Australia and America, with 1002 ladies gathering in Australia in 2017. Check out our full gallery of images from the weekend.